DC United, in partnership with UPLAY Canada, will be hosting ID sessions for the 2019/2020 season for boys born 2004 -2006. These Academy teams will start immediately for the upcoming 2019 summer season and run year round. There will be weekly fundamental training sessions with DC United trainer Stephen Lopez and teams will practice 2-3 times a week during the peak season. This program is geared towards the committed and will require teachable players and discipline. *contact information will be posted shortly. The DCBA Rep program is designed for players ages 8 to 18 who want to play on a competitive basketball team. Our players on the Rep teams will get the opportunity to compete in Ontario Basketball Association sanctioned tournaments, leagues and games across the GTA. Players are selected through open tryouts in September and the season concludes in April/May. AAU basketball is played in the United States. Our teams travel and compete vs the best competition in the country. Through our partnership with Nike UPLAY Canada, UPLAY Durham will have access to exclusive Nike tournaments and events. These events provide maximum exposure for athletes interested in obtaining a scholarship to a US school. DC United is our Elite Athlete Identification Program for boys. DC United starts at the grade 7 age level and goes up until grade 12. 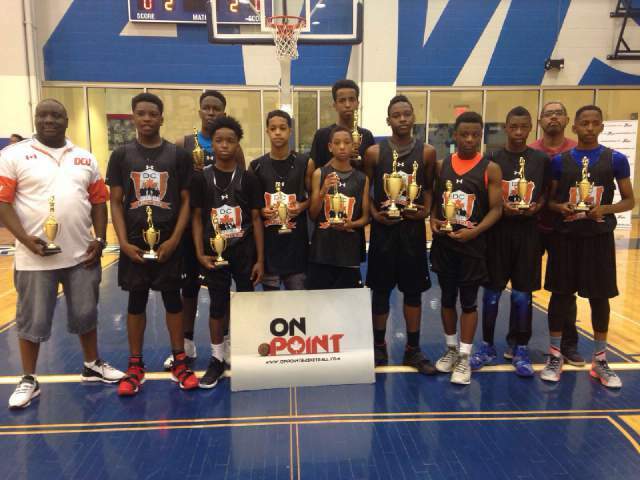 Our teams compete in the Ontario Basketball Association, Nike Signature League, CYBL and various tournaments. The program is also open to Bulldogs players who may not have been selected to a DC United team. Elite Athlete Identification Program for girls starting from grade 8 and 9 level. These teams will participate in the Nike Rose League, the top middle school circuit in North America. The program will identify Chameleons' players at the grade 7 level. How does the Nike UPLAY affiliation benefit my son/daughter. The affiliation now provides a clear opportunity for our athletes to compete at the highest levels of competition. UPLAY Canada operates teams at the U15/16/17 levels and these teams compete in the Nike Elite Youth Basketball League. Our players at the grade U12/13/14 levels have the opportunity to participate in the Nike MADE Hoops league under UPLAY Durham. Many players that participate in these leagues go on to earn athletic scholarships to Colleges/Universities in the United States. Fees can vary between $900-$1300 depending on the program you are selected to. We offer various opportunities for fundraising and sponsorship to offset costs for parents. We also work with our partners Canadian Tire Jumpstart, KidSport and Their Opportunity for families that require financial aid to assist with paying fees. We strive to make participation inclusive for everyone regardless of their financial situation. Our staff will work with parents to ensure that finances are not a barrier to participation. KEY HOOPS PLAYERS @ CP3 RISING STARS CAMP IN NORTH CAROLINA AUGUST 10-12.
oUR 8TH GRADE KEY HOOPS DC TEAM TRAVEL TO AUGUSTA, GA THIS WEEK FOR THE GRANDE FINALE, SPONSORED BY NIKE. GOOD LUCK!